A different approach to training. Let the horses train you. An exciting workshop in an exotic setting. 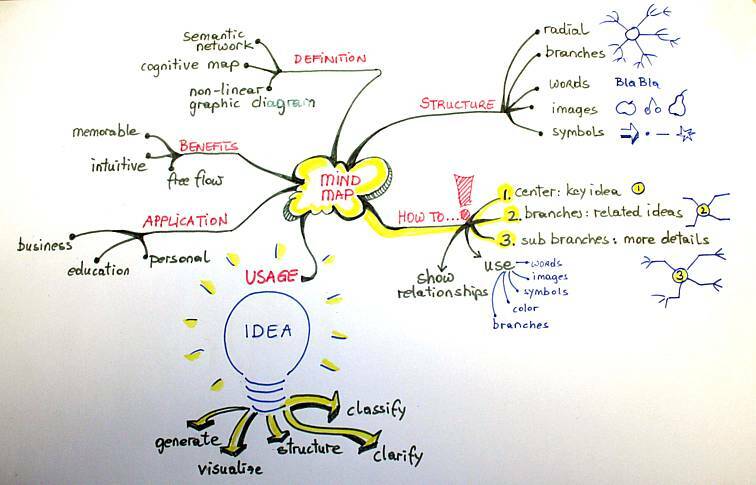 An interactive application of mind mapping. 99 words in praise of 99 Words. I and the other trainer-wannabes were treated as complete idiots. The training was centered around a hefty Trainer's Manual that contained patronizing and repetitiously redundant directions. Our Master Trainer further simplified these directions. The focus of the session was on the content. The session emphasized that we should never deviate from the standard script. We use an OJT approach to train facilitators who will be implementing our activities-based training packages. This type of training is combined with the last stages of our instructional design activity. The cast of characters in the train-the-facilitator sessions include the one or more expert facilitators who are members of the design team and one or more Facilitator Apprentices (FAs) who are going to conduct all training sessions in the future. The transfer of training responsibilities from the original facilitators to the FAs take place within the context of regular training sessions with real participants. Here's our step-by-step procedure for the train-the-trainer strategy (except we cheat and modify, resequence, and skip the steps to suit the needs and preferences of the FAs). In this description, we will pretend that you are the expert trainer and tell you what you should do. Prepare a thin Facilitator Guide . Avoid producing a hefty Facilitator Guide with pedantic scripts and superfluous stage directions (“Display Slide 87. Reveal one bullet item at a time.”) Your job is not to design an “idiot-proof” training system (which cannot be done anyway). Instead, prepare an outline job aid for each training module, specifying the desired outcome and suggesting time requirements, supplies, and the flow of activities. The best way to create this outline job aid is to have someone observe while you facilitate a regular group of participants and write down the real steps that you use. Before the training session ask the FAs to erase their mental picture of the traditional trainer. Explain that the FAs will be guide-by-the-side facilitators rather than sage-on-the-stage trainers. What they need is not presentation skills but facilitation skills. They also need the strong belief that all participants are smart, motivated, self-directed, and participatory. Emphasize that your goal is not to train the FAs to perform consistently (and mindlessly) and to produce predictable (and mediocre) results. Instead, you will require and reward their ability to creatively modify the training activities to achieve personalized performance outcomes from the participants. During the training session let the FAs experience the participants' excitement and misery. Conduct a regular training session for real participants. Intersperse the FAs with these participants and have them behave just like the others, taking part in all activities. After the training session: At the end of the session, give the outline job aid to the FAs and have them jot down notes about significant events, questionable behaviors, anxious moments, and confusing steps. Conduct a debrief session based on these notes. Clarify the rationale for your decisions and actions. Work with the FAs to improve the training package. Encourage them to come up with modifications that better suit their individual facilitation styles. Have the FAs co-facilitate the training session by alternating lead roles. Ask the FAs to individually facilitate the entire session, encouraging them to make suitable changes and incorporate personal touches. Provide reinforcement and feedback immediately following the session. Also provide feedforward tips for the next session. Let the FAs conduct a session on their own. Discuss their experience over the telephone. Set up a website to encourage FAs to share their modifications, problems, and suggestions to each other. Identify improvements and incorporate them in the “standard” package. This train-the-facilitator approach produces better results because it takes place within the context of regular training and encourages FAs to improvise improvements rather than behave as programmed robots. For more than 40 years, I have been locating, documenting, and experimenting with different interactive strategies for improving performance. About 5 years ago, just when I thought I had seen them all, my friend Ellen Kaye Gehrke introduced me to an unusual interactive approach that employs horses (yes, the four-legged animals) as key players. At first I thought that this was a flaky idea (like fire walking or levitation), but then I remembered that Ellen has a respectable Ph. D. She also has impressive results from graduate students and other cynical people who have been through her ELITE Leadership Institute (Education, Leadership, Instruction, and Training with Equines). Recently Ellen was interviewed by Jim Evans for a featured article in Under the Sun magazine. Read about the Horse Professor in a reprint of this article (4MB PDF; requires Adobe Acrobat). By the way, Ellen is currently writing a series of advice articles straight from her horse's mouth. If you live in Europe, it makes sense to attend a Thiagi workshop in Switzerland. Even if you don't live in Europe, come to think of it, it makes sense to attend a workshop in Switzerland. If you are live in Africa and Asia, Switzerland is a wonderful destination. If you live in the U. S. A., you can get a fairly inexpensive flight to Zurich and enjoy Winterthur, a city of culture and a leisure region, and participate in Thiagi's workshop. This workshop is designed for trainers, instructional designers, facilitators, and performance consultants. The workshop helps a wide range of practitioners from newcomers and experienced specialists to master skills and concepts related to different types of training games, simulations, and learning exercises. This workshop practices what it preaches. It helps you design and conduct 24 different types of effective training games, simulations, and activities. Based on 30 years of field research, these design formats enable you to create training faster, cheaper, and better. You will receive a hefty collection of training games during the workshop and have access to 2000+ web pages with additional games, activities, and facilitation tips. Empower participants to determine the scope and sequence of activities in corporate training and teambuilding situations—without neglecting the training goals and objectives. Make real-time modifications to different dimensions of facilitation to better suit a specific group of corporate participants. Employ appropriate strategies for handling disruptive behaviors and transforming resistive participants into productive allies. Use a seven-stage debriefing model for reflecting on intense experiences and sharing insights derived from them. On June 11, 2007 my Swiss colleague Samuel van den Bergh and I will conduct a workshop entitled Managing Diversity and Inclusion in High Performance Teams . Business teams today are rapidly assembled to meet urgent needs. Team members are likely to be strangers to each other because teams are highly diverse and often virtual. As the world becomes flatter, the number of diverse teams is increasing. GOOD NEWS: The most productive and innovative results are achieved from these highly diverse teams. BAD NEWS: The worst performing teams are also found among highly diverse teams. Based on more than 20 years of field research on organizing, facilitating, and advising highly diverse teams, the facilitators have created a set of guidelines and procedures for decreasing the problems and increasing the potentials of highly diverse teams. In this walk-the-talk workshop, you will experience a series of interactive exercises for mastering key strategies for improving the performance of multinational teams and applying them to your own situation. Identify potentials and pitfalls of highly diverse teams. Apply human performance improvement techniques to leverage the potential and reduce the pitfalls. Recognize the impact of included diversity. Apply human performance improvement techniques to enhance a high level of trust and create a team culture that includes everyone. Identify and utilize visible and invisible key diversity factors that influence the productivity of a highly diverse team. Learn to include diverse inputs. Apply 20 HPT principles and procedures for improving the levels of achievement and affiliation in highly diverse teams. Identify the needs of a highly diverse team through five stages of its development. Facilitate the team effectively through these stages. For Thiagi's 3-day training games workshop: 1800 Swiss Francs (about US$1,475 at current exchange rates). For Sam and Thiagi's 1-day Teams workshop: 660 Swiss Francs (about US$540 at current exchange rates). You can register online with a credit card in our secure online store. Your credit card will be charged in US dollars. You can also register by mail by downloading the Registration Form (85KB PDF; requires Acrobat) and following instructions. See our 8-page PDF brochure (325KB; requires Acrobat). Here's a graphics game adapted from the book. Explain the goal. Emphasize that this activity will provide a viable solution to a conflict. Name the problem issue and draw a symbol of it in the center of the sheet. Quickly come up with several advantages and disadvantages you can think of (go for quantity), and connect branches from the center as shown in the sample map, one for each advantage and disadvantage. Name each branch with a suitable label (the shorter the better). Use different colors for the center, the advantages, and the disadvantages. Think of the consequences of each branch (advantage or disadvantage), and add more branches to each item. Tap into your emotional image bank and draw symbols in addition to the words to get your point across quickly and effectively. Announce a 15-minute time limit for this independent activity. Instruct participants to share their maps. Ask participants to post their maps on a wall. Then ask them to take a “gallery walk” around the room, review different maps, and find a map drawn by someone who has at least one or two of the same items as in your map. Don't worry if what you consider to be an advantage is identified as a disadvantage in the other person's map. Instruct participants to work in pairs. Invite participants to pair up with someone else with a similar map. Distribute copies of the sample shared map (31KB). Ask the partners to create a new shared map that reflects only the areas on which they agree. The shared map should include an extra layer identifying what the partners are willing to do in order to solve the problem. Announce a 20-minute time limit for this paired activity. Instruct participants to share their collaborative maps. Instruct each pair to briefly present their collaborative map to the rest of the group. Suggest that the presentations focus on what they are willing to do. Conduct a large group discussion. Debrief the entire group by inviting them to talk about the similarities and differences among alternative approaches. Schedule a follow-up discussion. Give everyone a chance to digest different ideas. Ask participants to bring suitable action plans, timelines, or budgets for the next meeting. 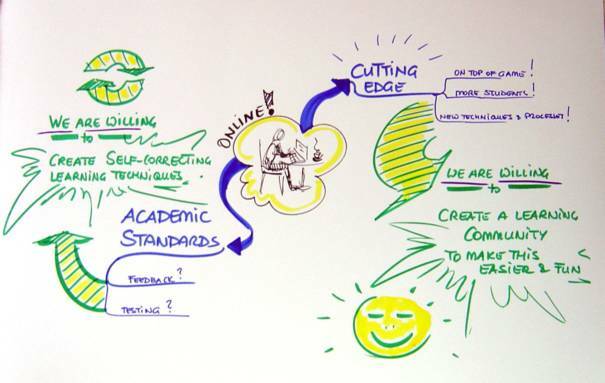 The design department at a community college was in conflict about deciding whether or not to transform its course offerings to an online learning forum. The department included a variety of faculty members from different backgrounds, ranging from the traditional to the progressive. Over the course of the last 5 years, the department has experienced a dispute between different teaching philosophies that escalated into a major conflict. This left the faculty emotionally drained and the problems largely unresolved. In addition, student enrollment started dropping significantly. Online teaching was considered as a strategy for increasing student enrollment significantly over the next two semesters. This suggestion resulted in additional conflicts. A textra game maximizes the learning from handouts and other reading assignments. Using peer pressure and peer support, this type of game reinforces learning from printed materials. In the August, September, October, and November issues of TGL , I presented brief descriptions of five textra games each. This month, I describe five more. You may expand and modify these descriptions to create your own activities that incorporate printed resources in training sessions. Basic idea. Participants independently review different chapters. Later, they coach each other on the key elements of the chapter they read. Eventually, pairs of participants who have been coached on the same chapter compete against each other by responding to an open question. Reading materials. Books with different chapters, collection of articles, anthologies, policy manuals, or product descriptions. Sample reading assignment. Corporate policy manual (with different chapters on recruitment, leave, payroll, harassment, and other such topics). Learning outcome. In response to authentic questions, rapidly retrieve relevant information and clearly present it. Flow. Assign different chapters to participants, but make sure that the each chapter is assigned to two different participants. Ask participants to study the assigned chapters, getting ready to coach someone else on the key points and the organization of the chapter. After a suitable pause, pair up participants who reviewed different chapters. Ask participants to coach each other on the chapter they reviewed. After the coaching episode, ask different (but equivalent) questions of the two participants who were coached on the same chapter. Distribute 100 points between these two participants. Repeat the same procedure with the other chapters. Basic idea. Participants review a list of guidelines related to an interpersonal skill. Different teams create and stage dramatic segments incorporating key principles and procedures associated with the interpersonal skill. One team does not produce a play but evaluates other teams' plays. Reading materials. Articles, checklists, or other job aids related to interpersonal skills. Sample reading assignment. List of guidelines for mediating a conflict between two people. Learning outcome. Mastery of an interpersonal skill and improved fluency. Flow. Review the key points from the document. Divide participants into teams and explain the play production procedure. Pause while teams prepare their dramatic segments. Ask teams to stage their dramas. After all teams have done this, ask the judging team to comparatively evaluate them. Identify and congratulate the winning team and comment on the portrayal of key concepts. Basic idea. Teams write several summaries of an article, repeatedly reducing its length. Reading materials. Article, handout, product description, research report, brochure, essay, or interview. Sample reading assignment. A case study describing the implementation of an innovative system. Learning outcome. Identifying key points and summarizing. Flow. Ask participants to read the material and take notes. Take away the reading material and ask teams to prepare a 32-word summary of the key points from the reading assignment. Listen to the summaries from different teams and select the best one. Now ask teams to rewrite the summary in exactly 16 words, retaining the key ideas and borrowing thoughts and words from other teams' summaries. Repeat the process, asking teams to successively reduce the length of the summary to eight and four words. Basic idea. Participants review different pages from a foreign news magazine. They write sets of generalizations, compare them, and identify key generalizations. Reading materials. Each participant receives three or four random pages from a foreign newspaper or news magazine. Sample reading assignment. Pages from back issues of the news magazine, India Today . Learning outcome. Generalization and identification of key patterns. Flow. Obtain copies of English-language news magazines (or newspapers) from a selected foreign country. Separate them into individual pages and distribute two or three pages to each participant. Ask participants to review the pages and write down salient cultural characteristics reflected in the news items, articles, and advertisements. Participants should write these characteristics on index cards, one item per card. After a suitable pause, collect the cards from all participants. Organize the participants into teams and give each team equal-sized piles of cards. Now ask the teams to organize the cards into suitable clusters and identify the most salient cultural characteristics of the country. Compare the lists of characteristics generated by different teams. Basic idea. Participants read and review a selected article. Teams of participants come up with questions related to the content of the reading assignment. Facilitator conducts a quiz contest using participant-generated questions. Reading materials. Articles, chapters, product descriptions, research reports, case studies, or interviews. Sample reading assignment. 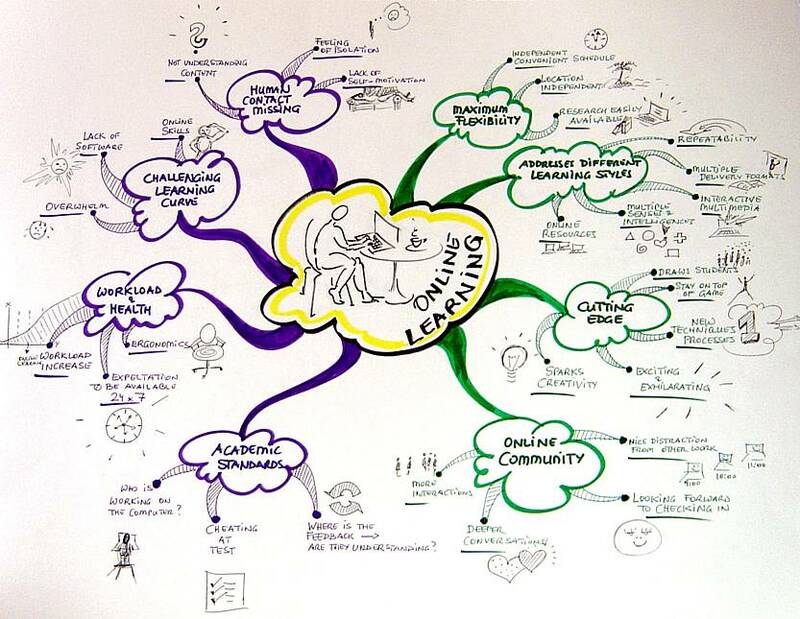 An article on new learning technologies. Learning outcome. Recall of details and key points. Flow. Distribute copies of the same reading assignment to all participants. Warn participants that the reading material will be taken from them after the study period. Encourage participants to take notes on the content. After the study period, organize participants into teams of three to seven members. Ask each team to come up with three or four closed questions and one or two open questions. After 3 minutes, ask a team to read a closed question and choose an individual from any other team to come up with the answer. Later, choose another team to read an open question and ask two teams to give independent responses. My friend Brian Remer is Creative Learning Director at The Firefly Group ( brian@thefirefly.org ) where he invents games and interactive strategies to expand learning and deepen insights. Brian has become such a virtuoso with the 99 Words format that I have blackmailed him into contributing a regular monthly column. Busy intersections are few in rural Vermont, but during tourist season you can wait a long time to make a left turn onto a crowded thoroughfare. Recently I just could not find a break in the traffic flowing east that coincided with the traffic flowing west. Then an idea! Switching signals, I turned right into the flow. Less than a tenth of a mile later, I turned left into a parking lot and took another right joining the traffic in the direction of my original intent. Got something difficult to do? Try the opposite! Rahul George (Join the Dots, Bangalore, India) sent us an endorsement of the 99 Words “game”, using exactly 99 words. I have begun to explore the value and virtue of 99 Words lately—this game is unlike any other I have explored when it comes to sharpening expression—creative and rational. Tools for presentation, especially in the area of written communication, are fairly impractical and apt to be forgotten in time. However, 99 Words really does pack a punch. You are on edge to make literally every word count. I feel the impact of this game even as I am writing my endorsement—my thoughts are aligned and alive!! Try it for yourself and you will agree. In 99 Seconds , the presenter makes a brisk, self-contained presentation that lasts for less than 99 seconds. For more details about this format, check out the April 2002 issue of our newsletter. You can incorporate simple physical activities to increase interactivity in your 99 seconds presentation. Raise your right hand and extend the index finger. Write a large number 6 in the air. Next activity: Lift your right foot a few inches above the ground. Draw a large circle in the clockwise direction with your foot. Keep drawing large clockwise circles. Now combine this activity with the first activity. Write a large number six with your finger. Make sure that you are drawing clockwise circles with your foot at the same time. If you are like most people you find it impossible or very difficult to do this multitasking. What's the point? Be careful about multitasking. You will end up messing up both tasks. Tracy Tagliati is an HR Corporate Trainer for Mercury Insurance Group. Did you know there's a profession where you earn a living designing and playing training games? Does that sound like fun? Well, consider what's involved. The workdays are consumed with research, experiments, assessments, and more. Therefore, play can be work. However, work-based training games have transformed the learning experience, and statistics indicate that participants are able to retain more information. Previously, participants learned content through lackluster lectures and time seemed to drag by. Nowadays, participants learn content through engaging in games and time seems to fly by.